This X Factor Obstacle Course is a 40' obstacle course race where the participants race through a series of crawl tubes, pop outs and squeeze walls then up to the top of the slide on a rock climb and slide to the finish. Not challenging enough? 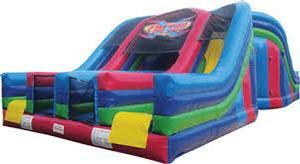 Add on the 22' Vertical Rush Slide to the end to make the dreaded Juggernaut. 68 feet in length guaranteed to be a challenge.